Xbox One announced: Steve Jobs' dream device has arrived, and it's made by Microsoft. And it’s made by Microsoft. Meet the Xbox One. 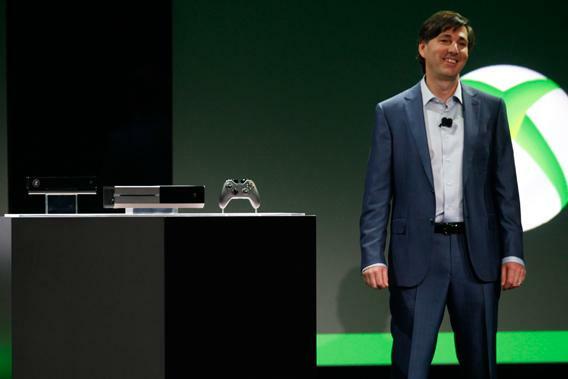 Don Mattrick of Microsoft reveals the Xbox One during a press event in Redmond, Wa. on Tuesday. Today, I saw something very close to Steve Jobs’ dream device. Just like he envisioned, this machine turns itself into the hub of your living room. It plays video games, Blu-ray discs, TV shows, and everything you could possibly want from the Internet. It switches between this stuff seamlessly—you can forget about the Input button. And it does indeed have the simplest user interface imaginable, an eerily accurate voice recognition system that is far more intuitive than a remote control. Want to watch MTV? Want to see what’s on HBO? Want to switch between TV and a Blu-ray? Just tell it what to do, and it will respond instantly. Before you say anything, though, you’ve got to say its name: Xbox. That’s right: In a new device it’s calling the Xbox One, Microsoft has done what Apple has long been rumored to do. It has created a near-perfect living room machine, one that has the potential to finally make it simple for you to watch or play anything you want, from anywhere, very quickly. Here’s how it works: Go to your TV and say, “Xbox on.” Your TV and Xbox turn on immediately, with no pause for booting up or logging in. You’re presented with a menu—it looks very much like the Windows 8 home screen—featuring apps, games, and other stuff you’ve recently interacted with. Now go to town. Say, “Watch CNN.” Your TV goes to the channel instantly. Say, “Xbox game,” and the device switches to the game you were playing. Say “Snap Skype” and the One brings up Skype in a panel to the side of your screen. Now tell it to call your mom. The One can also add its own elements on top of a TV broadcast—for instance, it can show your fantasy football stats as you’re watching an NFL game. What’s remarkable about this is how quickly the device switches from input to input—going from TV to a Netflix show is as quick as changing the channel on your TV, and it happens with natural language commands. In addition to letting you watch and play, the One also connects to social networks and lets you browse the Web (which you’d never want to do on your TV, but I suppose it looks cool in a demo). While it’s not very attractive—it’s got a boxy, early-VCR aesthetic—it does solve some of the persistent problems with using a video game system as a set-top box. Unlike its predecessor, the Xbox 360, Microsoft says the One is nearly silent, and it turns itself and your TV on instantly, with a single voice command. Still, while Microsoft’s launch event was impressively bombastic, it left many questions unanswered. The company showed a flawless live demo onstage—the One never misinterpreted a spoken command—but I didn’t get an up-close look at a working device. (Microsoft promised to reveal more at the E3 video game conference next month.) The company was also cagey about how the One will interact with your crappy cable box. Unlike in Jobs’ perfect system, the Xbox One won’t replace your box. It will let you switch channels by voice, and it will be able to layer its own content on top of what’s on TV. But as the Verge’s Nilay Patel points out, the One likely won’t act as a DVR that saves TV shows to its drive, and you will still likely have to interact with your set-top box’s clunky user interface. There are also a couple of aspects of the Xbox One that gamers won’t like. First, the device won’t play Xbox 360 games, so if you want to go back to those titles, you’ll still have to keep that console around—in which case the One really isn’t the all-in-one system it promises to be. (The company says it couldn’t maintain backward compatibility because the new system has a different processing “architecture.”) Also, when you put a new game into the One, the game is automatically installed on your hard drive, meaning that you don’t have to keep inserting the disc when you want to play. This sounds nice, but there’s one catch: If you want to install the game on another Xbox One—that is, if you sell your game—you’ll have to pay a fee to do so, as Microsoft told Wired in a statement. (The company didn’t specify the fee, and it didn’t say whether you could play the used game from the disc without “installing” it to the One’s hard drive.) On the other hand, Microsoft did quash rumors that the One would need a constant connection to the Internet—you can play single-player games without connecting, it says. More unknowns: the One’s price and release date. Microsoft said the One would come out “later this year,” though I’m guessing that doesn’t mean tomorrow. It gave no hint on pricing. When it released the Xbox 360 in 2005, that device started at $299, and it now sells for as little as $179. The other reason I’m hoping for a low price is that Microsoft needs to make the most of its head start. The One isn’t perfect, but it might be the closest thing we’ve seen, so far, to the living-room computer of our dreams. Microsoft needs to get it out to as many people as possible before Apple and Google create similar devices. There’s Sony, too, whose upcoming PlayStation 4 is staking out a similar gaming-plus-media-device niche—though Sony’s device looks far less intuitive than Microsoft’s. (Nintendo, meanwhile, looks out of the game at this point; its Wii U has been a flop.) What’s more, the opportunity is huge. Americans watch TV more often than they do nearly anything else, and when they’re not watching TV, they’re often playing games. The Xbox One is the first device I’ve seen to bridge these two activities in a way that isn’t clunky. If Microsoft can own that overall experience, the giant of the American tech scene could reawaken.